In a previous post we looked at the temperature classification of different fish species – cold water, cool water and warm water. For each fish species there is a preferred temperature range that, given the choice, they will spend more time in. This “thermal optimum” temperature will not be too cold or too hot. There are a variety of differing sets of data available. The charts below are a summary of two of the them that appear to have been collated from a larger number of refereed journal sources. For each fish species there is a preferred temperature range that, given the choice, they will spend more time in. This “thermal optimum” temperature will not be too cold or too hot. Table 1. Preferred temperatures for various fish species in °C. Table 1. 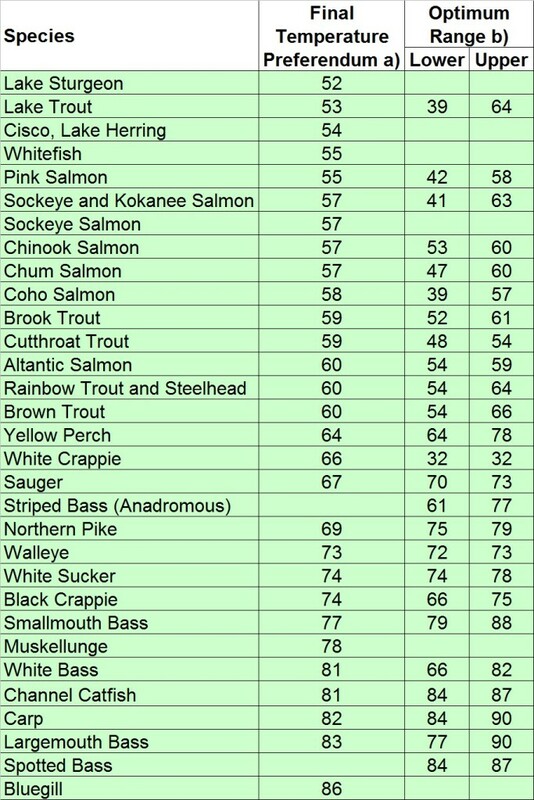 Preferred temperatures for various fish species in °F. The data in the first column is for the final temperature preference (FTP) for each fish species. This is the temperature that the species will gravitate to when exposed to a full temperature range (i.e. fish preferred temperature). It is thought that larger fish can generally handle colder temperatures – colder water also has more oxygen content. Temperature for where prey are may be more important when fish are actively feeding. As temperatures drop fish become less active and below a certain temperature a semi-hibernation takes place. a) S.S. Hasnain, C.K. Minns, B.J. Shuter, Key Ecological Temperature Metrics for Canadian Freshwater Fishes, Applied Research and Development Branch, Ontario Ministry of Natural Resources, 2010.
b) J.V. Morrow, C. Fischenich “Habitat Requirements for Freshwater Fishes” EMRRP May 2000.